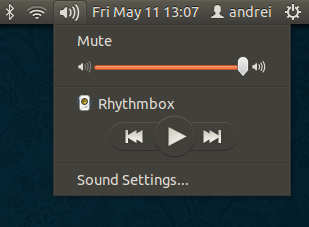 The Ubuntu Sound Menu can get very crowded because many applications are automatically added the first time you run them. 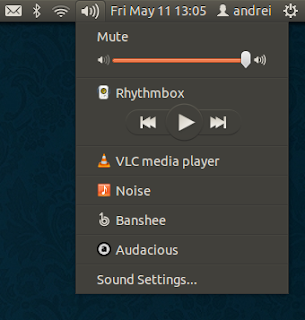 Here's a quick way to remove / blacklist applications from the Ubuntu Sound Menu (for Ubuntu 12.04 only). gsettings set com.canonical.indicator.sound blacklisted-media-players "['app1', 'app2', 'etc']"
gsettings set com.canonical.indicator.sound blacklisted-media-players "['audacious', 'vlc', 'noise', 'banshee']"
Then open Dconf Editor, navigate to com > canonical > indicator > sound and you'll see a list of media players added to the Ubuntu Sound Menu under "interested-media-players". To blacklist some media players, add them to the "blacklisted-media-players" key.